What do looted antiquities really contribute to Da’esh’s revenue? Will scanning heritage save it? Our Secretary, Rene Teijgeler, was interviewed by the Guardian, in a podcast you can listen to here, elaborating on the work and ethics of Heritage for Peace, together with ASOR’s Michael Danti, and Angus Martin from CyArk. HFP’s Greg Fisher was interviewed on Sirius XM Canada Talks on September 3 about ISIS and the destruction of Palmyra. On August 29, the French released satellite images confirming the extent of the destruction of the Temple of Baalshamin, available here, and the DGAM released photos . On 30 August, numerous reports surfaced that Da’esh had dynamited the Temple of Bel (see the BBC, al-Jazeera, etc). Whislt some suggested the damage might not be as bad as feared (eg the Guardian), on 1 September it was confirmed by satellite imaging that the Temple of Bel at Palmyra had been almost completely destroyed. There have been numerous articles covering this, in the BBC,Reuters, ARCA, and by the DGAM, etc. The DGAM released a statement on the destruction. The ASOR Syrian Heritage Initiative released a special report on the damage, which can be read here. According to the Guardian, the DGAMs Director, Maamoun Abdulkarim is reported as saying that ‘the world is witnessing the systematic destruction of Palmyra, and that he has lost all hope of the historic city’s treasures being salvaged’, reporting too that IS militants are conducting excavations to sell antiquities on the black market as well as destroying the site. On August 30 the DGAM reported that a mortar round impacted the Damascus citadel. According to an undercover reporter for CBS, not only are Da’esh charging a 20% tax for all items looted in areas they control, but if the looters use heavy machinery (bulldozers etc) rented to them by Da’esh, they charge a 40-50% tax on everything found. The article also details prices for looted artefacts and offers insight into the way the illegal trade works. Read the full article here, and the comments by Fincham in his blog. Christian Science Monitor have written an interesting article looking at what antiquities smuggling really offers to Da’esh in terms of funding, compared to their other sources of revenue. They argue here that antiquities are coming to play an increasingly important role as a finance stream while others are diminishing, a statement debated by others. On August 26 2015 the FBI put out an alert about Near Eastern antiquities, saying that “we now have credible reports that U.S. persons have been offered cultural property that appears to have been removed from Syria and Iraq recently.” The statement is available here. On September 3 2015 the Syrian government announced that it had awarded Khaled al-Assad the Syrian Order of Merit. Al Assad was executed by Da’esh, apparently for his refusal to lead them to Palmyra’s antiquities. A group of brave Syrians are attempting to build a library to preserve books taken from destroyed houses, some of which were still burning when the courageous students rescued the private libraries. More than 11,000 books have been saved. The volunteers take turns to work as librarians and have created a check out system to keep track of borrowed books. They also wrote the original owner’s name inside each book, in the hope of restoring them to them after the war. Read the full article here. “In defiance to the destruction and havoc being wrecked in Palmyra, an imposing statute of Queen Zenobia, the 3rd century queen of Palmyra, has been erected in Damascus at Umayyad Square where it will be on display for the next four days.” Read the full article here. On August 26, at the Damascus Museum, Syrians held a protest against the actions of Da’esh at Palmyra. The DGAM report is available here. Actions of the worst kind … Reports have surfaced about collusion between Turkish officials and Da’esh, according to several sources – see this report in the Guardian, and this one in Business Insider. On September 4 2015, the Association for Research into Crimes against Art (ARCA) blog published a memoriam for the destruction in Syria and Iraq. Tributes can be read here, and any archaeologist / heritage professional is welcome to contribute. 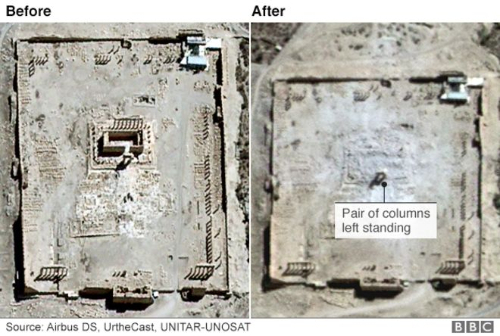 CNN looks at 3D camera technology, and its use in preserving cultural heritage, available here. On September 7 2015 UN officials reaffirmed that protecting Syrian and Iraqi cultural heritage is essential for any future peace, available here. The National Museum in Beirut is helpign to save not only Syria’s heritage, but the heritage of the region. Having already been through a traumatic civil war, they offer advice to protect heritage based on pervious experience, and are working to stop the illegal trade in antiquities. Read the full article in Qantara.de here. Archaeologists working at Pisidia have protested the murder of Khaled al-Assad, reports Hurriet Daily News on September 1 2015. The Society for Iranian Archaeology has released a statement about the murder of Khaled al-Assad. Part of the statement reads: “His life-long dedication to Palmyra, even in the face of death during his final moments, is a prime example of an archaeologist’s courage and loyalty to the stewardship of cultural heritage for future generations. Without a doubt, Khaled Al-Asa’ad will be remembered as representing not only stewardship of Syrian culture and history but also world heritage”. The Manar al-Athar open-access photo-archive (based at the University of Oxford) offers “high resolution, searchable images, freely-downloadable for teaching, research, heritage projects, and publication.” All images are freely availble for use. The photo archive of the Syrian-Norwegian research project Palmyrena: City, Hinterland and Caravan Trade between Orient and Occident is also available online here. A “Syrian Tourism Day” was organised by the Syrian Club in Chile to draw awareness to the destruction of Syria’s heritage. Read more here. In what is (IMO) the best of all the articles on Da’esh and site destruction, Mark Hay considers what can be done to stop ISIS on September 1 2015, available here. Also well worth reading, archaeologist Bill Caraher reflects on recent events in his blog on September 10 2015, and makes an excellent argument for putting people at the heart of archaeology and current events. In a lovely article, well worth reading, Nature pays tribute to scholars in Syria, calling them heroes, on August 25 2015, available here. Dr Jachec-Neale, writing for the policy think tank Chatham House, offers suggestions for how to stop the destruction of cultural treasures, available here. The CBC is running a series on its program “Ideas” called “Who Owns Ancient Art”? Part One here: destruction ‘from Parthenon to Palmyra’, in which Matthew Bogdanos, Colonel in the U.S. Marine Corps Reserves, and assistant District Attorney in Manhattan, and a lead on heritage protection, discusses opposing views with Jonathan Tokeley-Parry, antiquities restorer and former smuggler of ancient Egyptian artifacts. Joris Kila writes for ARCA on heritage destruction and iconoclasm, here. Joanne Farchakh tells Robert Fisk, in the Independent, that she thinks Da’esh are destroying sites to cover up the evidence of their looting. The article also examines the group’s manipulation of history. The Guardian details the damage to Syria’s heritage, particularly Palmyra, and some of the work to save it, highlighting the work of the DGAM’s director, on 24 August. A number of people have discussed the significance of Palmyra and why ISIS presumably targeted it (and other sites), including Michael Danti (ASOR) for NPR, Newsweek, The Guardian, Christian Science Monitor, the BBC, CNN, and Richard Dawkins slammed Da’esh as ‘ignorant vandals’ in the Huffington Post. The Washington Post considers ‘What Palmyra looked like in the 1800s’, available here. A little vignette on the effects of the destruction of Palmyra in Australia, in ABC. On September 3 2015 The Guardian examines cultural destruction in its wider context ‘from Parthenon to Palmyra’, available here. Several papers have discussed the wide array of site damage seen in the Middle East, including the International Business Times, National Geographic, and the Washington Post. David Fincham on August 28 2015 argues that Syria needs Da’esh destroying, availabe here. Another article about Da’esh’s cultural and human atrocities, but suggesting that ultimately, it’s the stones we should intervene to save, available here. Franklin Lamb in Counterpunch on August 26 2015 argues that the damage to heritage in Syria constitutes a war crime. Similarly, The New York Times on August 25 2015 examines ‘The Crimes of Palmyra’.